Find out why guests keep returning to The Smith Shark Shack! The owners spared no expense with the total renovation of this gorgeous 18th floor condo, overlooking the beautiful beach. They did the renovations for their own personal use and are extending an invitation for discerning guests to share this beauty. 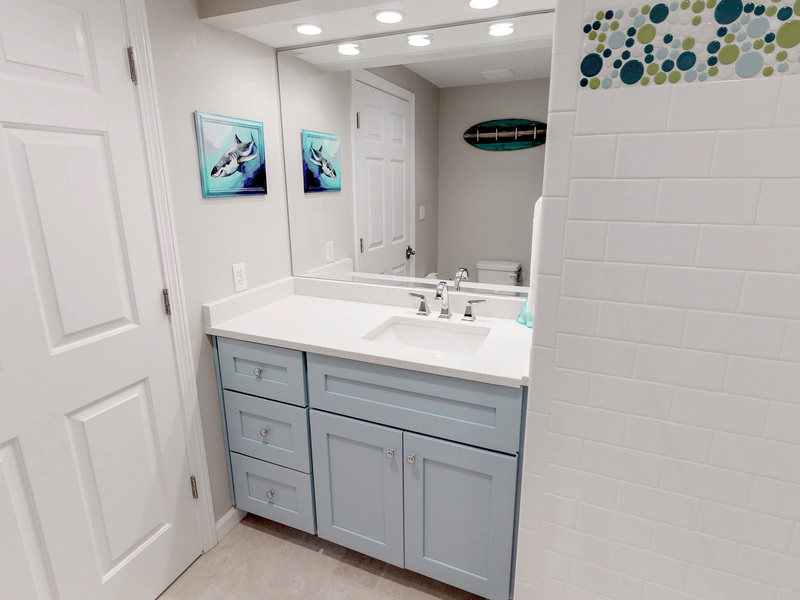 Using fun shark-themed decor, the only thing you’ll find scary is the thought of having to leave here and return back home! 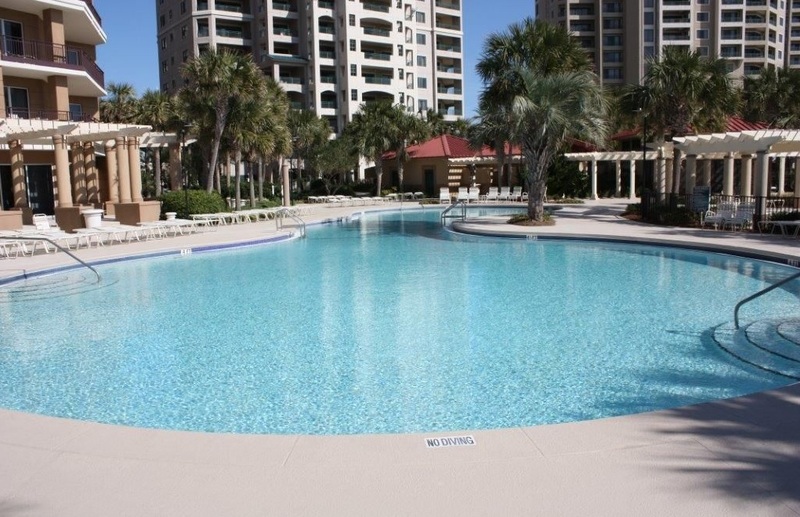 Westwinds is the crown jewel of beachfront vacation rentals in Sandestin. 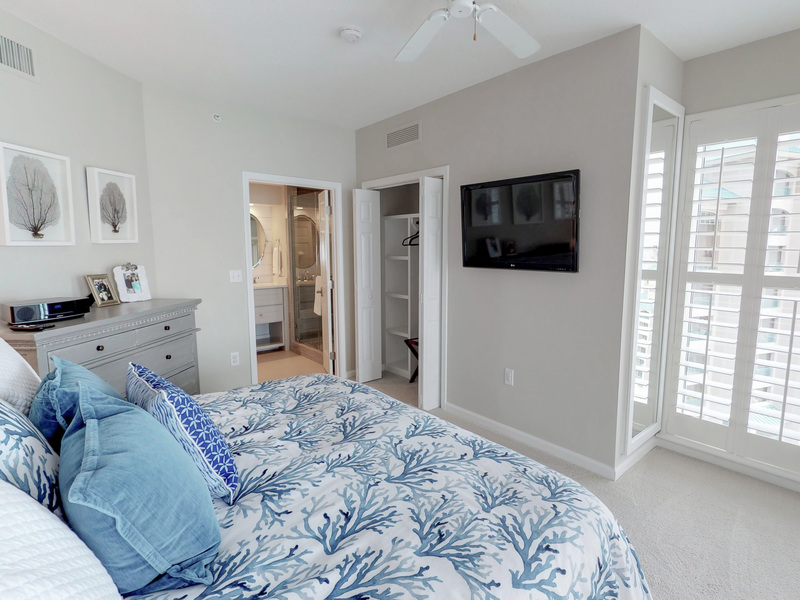 There are only 8 of these floor plans with larger square footage and full-sized windows in the bedrooms, offering twice the view of the beach and a view of the beach while laying in your bed. The living room, complete with two walls of windows, features a wave painting by noted local artist, Justin Gaffrey. There is a 49" Class Samsung Smart - 4K Ultra HD TV including a sound bar for incredible movie-watching when relaxing at night. You’ll find a DVD collection, with something for every age group. There is also a game cabinet, stocked with your family’s favorite games and puzzles – perfect for a rainy day at the beach! The dining area, with comfortable seating for eight, features a large, concrete top table with an oyster chandelier. In addition to this, there are two stools at the kitchen counter. Adjacent to the dining area is a wine/beverage fridge, perfect for keeping all of your favorite beverages cold – it really helps to free up space in the kitchen refrigerator! The kitchen, featuring Vetrazzo countertops with recycled glass and oyster shells, is completely outfitted for any entertaining. From sea-inspired tableware and glassware to beautiful serving platters and bowls, each meal at the beach can be a special one. 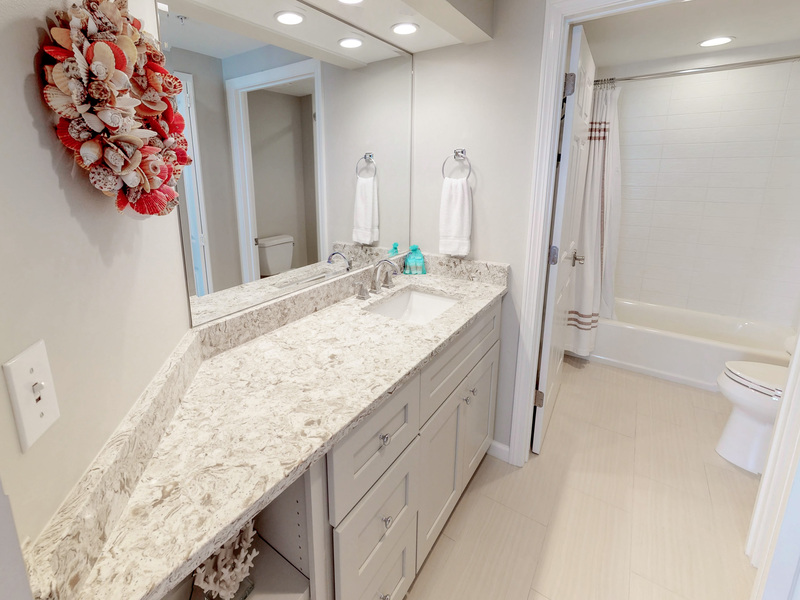 All three bathrooms feature new cabinetry, new quartzite countertops, new tile and beautiful new fixtures. You’ll feel like you are staying at a five-star resort, rather than in a tired, old rental. 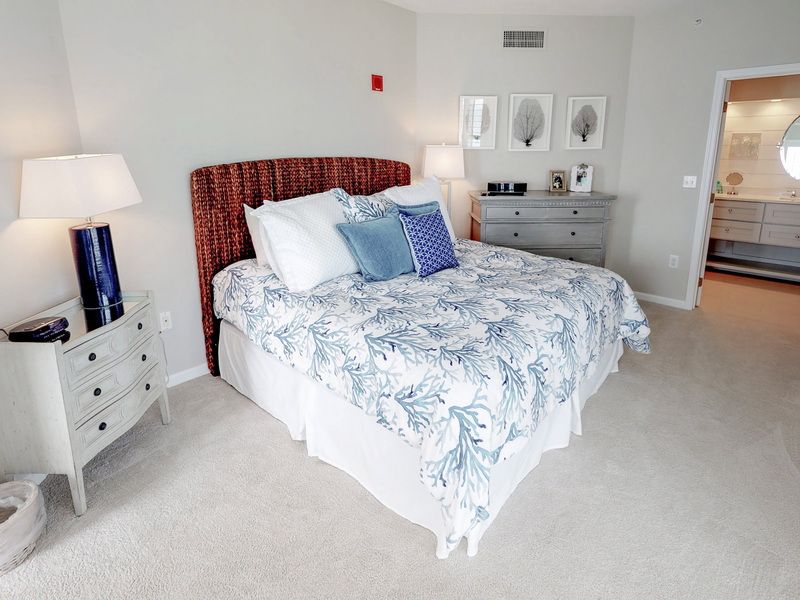 Each bedroom features a down comforter, with sea-inspired décor. 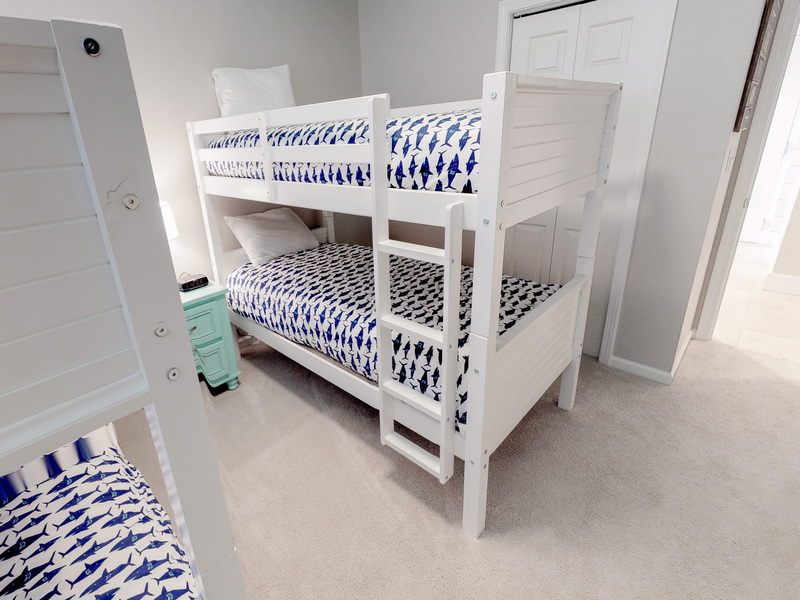 Whether you are in the “Sunrise Room” – painted in the exact same coral color as the beautiful sunrise at the beach, the Shark-themed bunk room, or the “Sea Coral” master suite, you’ll feel right at home. The master suite also features a Bose Wave clock radio/CD player. There is a wall mounted TV in each of the bedrooms and the secondary bedrooms also have a DVD player. At Westwinds, there is a lot to enjoy, besides the beach. You will find one of the most luxurious pool areas (with seasonal concession/bar) and a kiddie pool. A Jacuzzi is provided for adult use. There is also a well-equipped workout room, overlooking the gorgeous pool. Beyond the pool is the sugar sand beach. You may choose to rent chairs and umbrellas from the resort, or you may bring your own. At Westwinds, you can walk to your choice of restaurants on the beach, including The Beach House and Barefoots Beach Bar and Grill at the Sandestin Hilton. There are two additional restaurants inside The Hilton, which are open for our guests as well. You can also walk to the Serenity by the Sea Spa at the Hilton. Our family had a fantastic time staying at this lovely vacation high rise. It had everything we needed to have a memorable trip with our kids! 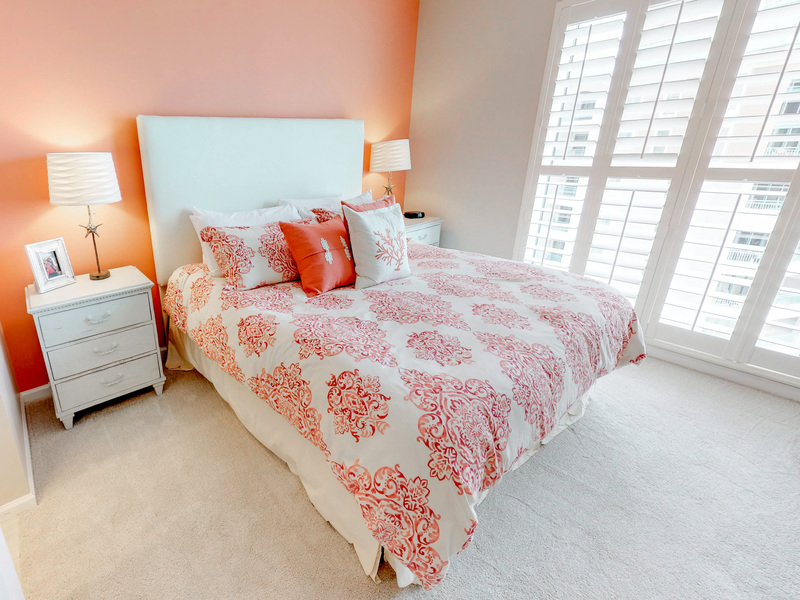 We thank you for sharing your thoughts on this absolutely gorgeous condo. The reason the water was shut off is that all units in Westwinds have a water sensor that recognizes if there is a possible leak. It is a highly sensitive system . For example: if there is some water near the base of the toilet the water will shut off thinking there is a leak. If this occurs we want our guest to call the office and let us go through the proper process to get it back on. I know you did call early on a Sunday because I got the after hours call. While I was in the process of notifying Westwinds maintenance, you found the last resort way to turn it back on. For liability reason we prefer guest let us know so we can determine if it is a false alarm or truly a leak. I received a text stating the water had been restored. We reached out the following day and left a voice message. So sorry for any confusion. Despite the water issue, we are pleased you gave high high ratings in all categories. Remember, returning guest receive a 10% discount on any of Platinum Vacations properties. We hope to have you visit again int he near future. This condominium is one of the most beautiful we have ever stayed in and we have stayed in a few. The colors are soothing and very beach friendly and the artwork is beautiful. You can tell the owners love the beach and all that they enjoy there. It has taken time to collect the knick-knacks they have displayed and that adds to the ambience of the condo. The view of the beach is perfect. The beds were comfortable and beautiful. We were located close to anything you would want to do, good restaurants, great art galleries, bikes, shopping, etc. We would love to use this condo again in the future. Best unit we have stayed in at Westwinds! We have been coming to Westwinds in Sandestin to stay for many years now, and tried a new condo each time. This was by far the best one yet. My wife and kids all agree too. Nice amenities, great setup. We will now try to book this condo each time we come. Highly recommend it! An absolutely beautiful and comfortable condo. A million dollar view! This is our second time in this beautifully remodeled condo. Beautiful views, terrific location, very comfortable beds. <br/><br/>Our only complaint is the management company...we couldnt get anyone to answer when our water was off (a Friday at 4pm). Luckily, another resident helped us find and reset the HALO system. They also are stingy with dishwasher soap (one pellet for a 4 day stay), dish soap and trash bags. So make sure to bring extra with you, along with beach towels. We are very pleased to have you as a returning guest of the gorgeous condo. I am not sure what number you called at 4:0O PM CST since our office does not close until 5:00 CST. We would have immediately assisted you in restoring the water to the condo since the sensitive water alarm went off. This system is suppose to help detect any leaks that might occur in the condo however; a small amount of water on the floor can sometimes set it off. We will be placing some detailed instructions in the unit so that guest will know what to do in the event it happens to them. We have decided to follow through with your suggestion on a few additional amenity items such as the trash bags and soap. I agree this would be nice to provide the guest with a few more housekeeping amenities. We hope to see you again soon. Remember, all returning guest get a 5% repeat guest discount. Also, make sure to book directly with Platinum Vacations of Destin to avoid additional service fees. Make sure to tell all your friends! We have been coming to Sandestin for the past 15 years and this is the best rental we have ever stayed in. Amazing views, super clean and just gorgeous. The decor is great, beds are comfortable and everything was updated. There was plenty of room for 4 adults and 4 kids. Would definelty recommend this place and we cant wait to stay here again. We are so thrilled your expectations were met with your accomodations at Sandestin. This truly is an amazing condo and the owners have left no stone unturned. We hope you will visit us again soon and do remember when you book direct you save an extra service fee. We thank you again for choosing Platinum Vacations of Destin. Outstanding! Beautiful unit and beautiful view! I could not have said it better myself! It truly is one of the most gorgeous condo's I have ever seen. We hope you plan on returning soon! Please LIKE US on TWITTER and INSTAGRAM and SHARE on FACEBOOK to qualify for our monthly give away. Just Google PLATINUM VACATIONS OF DESTIN and it will lead you to these social media sites. This month’s April giveaway is a IPAD. 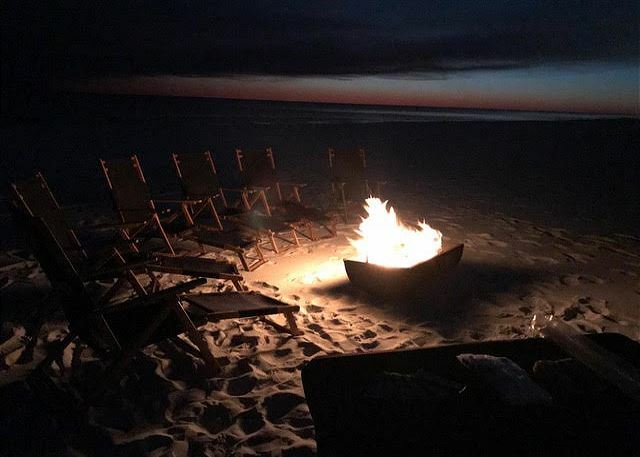 Again, we thank you for choosing Platinum Vacations of Destin and hope to see you again soon. Excellent condo at westwinds. Beautiful and all the conveniences we needed. Lots of space for everyone. This is a beautiful/luxurious condo with a short walk to the beach. We absolutely loved it but there were some extra expenses that we didn't expect. The paperwork you receive tells you to call if you arrive early and you can check in if your condo is ready . What it doesn't say is they charge 50.00 to do it. The beach chairs are also a hefty charge when they should be included with the rental. For two days it cost us 200. 00 in beach chair rentals. This condo sleeps 8 people. Most condos provide at least 2-4 chairs with the condo rental. It doesn't tell you about that extra cost in the paperwork either. So it cost us an extra 250.00 that we did not expect. I can't imagine how much it would have been for a whole week. Other than the extra expense, the condo was clean, service was good, and location was perfect and convenient to great shopping and restaurants. The view was spectacular and yes, we probably would rent it again just for those things. Unit was very nice. Management company is one of the best I have dealt with, great job!! This condo far exceeded our expectations. It is beautifully decorated, clean, and has the most amazing view of the ocean. We didn't want to leave!!! We will definitely be back! Hi Kaye, I 'Amazing' to say the least! It's never fun when it comes time to leave but you are welcome back anytime. Don't you book your next stay with us, you will receive the 10% Returning guest discount. You can also follow us on Facebook, Instagram & Twitter to stay connected and find out about current specials and giveaways! This rental was hands-down one of the very nicest we've ever stayed in! We felt more as if we were guests in someone's beautiful home than renters. The freshly renovated unit is perfectly appointed with subtle tones that blend beautifully with the breathtaking views of the ocean. We enjoyed coffee and breakfast on the balcony each morning and cocktails there in the evenings. We even had a full moon over the ocean the week we were there!<br/><br/>Our trip was an end of the summer last hurrah with our two daughters who are leaving for their first year of college and our other two daughters who are in high school. We love the location as everyone could come and go from the pool or beach as they pleased, have lunch or just take a break up in the condo during the day, and we all loved going over to Baytowne Wharf in the evenings to enjoy live music, dinner in one of the many restaurants or just a scoop of ice cream. This rental is great for families of all ages as the pool is just out the door (with a baby pool) and the ocean just a few steps further. <br/><br/>Platinum Services was great to work with, with a handy app for my phone that walked us through every step from check-in to check-out. One morning the AC didn't seem to be working, and they had maintenance there within the hour to fix it. They were very responsive, friendly and helped our trip go smoothly.<br/><br/>We look forward to returning to the Smith Shark Shack in the future and highly recommend it to anyone planning a vacation in the Sandestin/Destin area! Jenni, I couldn't agree with you condo is absolutely stunning! The owner's worked hard to ensure guests felt at home! It's always great to get away for a family vacation and have an opportunity to create memories that will last a lifetime! I wish the best to your daughters as they begin the next chapter in college. I'm sure the time at the beach was just everyone needed going into the next school year. I apologize about the small hiccup with the a/c and I'm so glad we were able to fix it for you so this summer heat gets the best of us. Thank you for choosing Platinum Vacations for your travel plans. When you are ready for your next beach getaway, please be sure to give us a call and you will receive the 10% Returning Guest Discount. Also, please take a moment to follow us on Facebook, Twitter and Instagram, where you can stay current on all of our specials and monthly contests! We simply loved the Smith Shark Shack!! 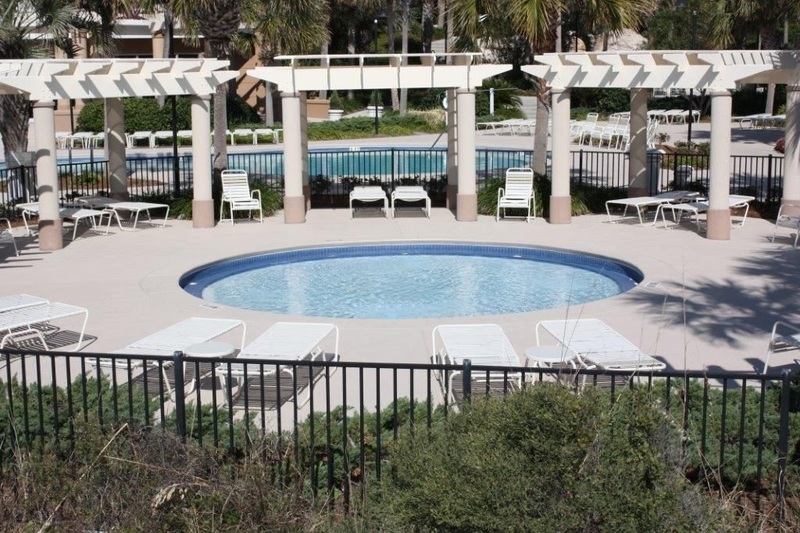 We have been staying at Sandestin Westwinds condos since 2001 and this one was by far our favorite!! The views were spectacular from the 18th floor and the condo was impeccably furnished with all updated decor and appliances. Our every need was met for our entertainment when we were not enjoying the beach or pool with many games, puzzles, etc. We plan to be back for sure and had some of the most lovely beach weather for late July with only 60% humidity and highs in the mid-80's!!! Really hated to leave!!! The condo was perfect! Great view for morning coffee or evening sunset. The kitchen was well stocked (regular coffee pot and Keurig), and the beach wagon was a life saver! There was plenty of space for everyone to spread out. Grace was super helpful and we leveraged iWheel to do all of shopping in advance.<br/><br/>Only suggestion were for small convenience things nothing specific to the unit: 1 dishwashing sample wasn't enough for a week, some beach toy/boogie boards and a few more towels would have been nice. There is a Dollar General very close and they have everything you might need (paper plates, solo cuts, and even boogie boards).<br/><br/>We loved it and would totally come back and have told several people about it already! It sounds like you had a wonderful vacation and now have some great memories that will last a lifetime! I condo is perfect! The views (& decor) are absolutely amazing! Please give us a call when it's time for your next beach vacation! We would love to have you stay with us agina! Thank you for choosing Platinum Vacations! The condo was beautifully decorated, kitchen with plenty of items for cooking. Stayed with 3 kids, 4 adults and plenty of room. Terrific view of the beach and our teenagers from balcony Washer/dryer in unit. The building is on the edge the condo my key, houses on the beach to the the beach was less crowded than further to the left with all the condo buildings. <br/><br/>My only complaints involves the management service. We had to ask for garbage bags (cheap, flimsy, tore easily) and there were no coffee filters; typically stocked in rental properties for a 3-day rental. Bring everything...salt and pepper not even there. Also, bring your beach towels. A map to the property would have been nice, and the shuttle routes/pick ups. Also, very little info on golf cart rental...we weren't there long enough to figure that out. Thanks for sharing that you enjoyed your accommodations at Sandestin. An upcoming guest will appreciate the helpful information on where to hunker down a the beach. We do supply an initial supply of paper towels, toilet paper, trash bags, soaps, dish-washing detergent etc. This is so if the guest checks in late at night they can make it a few days before having to purchase these items at the grocery store. Vacation Rentals are different from Hotels in this manner. We also share all of this information in our fabulous app. It has maps of the property and the shuttle. Perhaps you did not down load the app. Its a great tool for our guest all on your phone! It is a Hospitality Rules and Regulations law that we do not leave any edible items in the condo for health reasons. This is why there was not salt and pepper. It use to be companies provided coffee filters however; most condos do not use this type of coffee pot any longer. They use the coffee pods instead. Again, we are happy you enjoyed your stay and remember you will receive a 10% discount on you next stay. 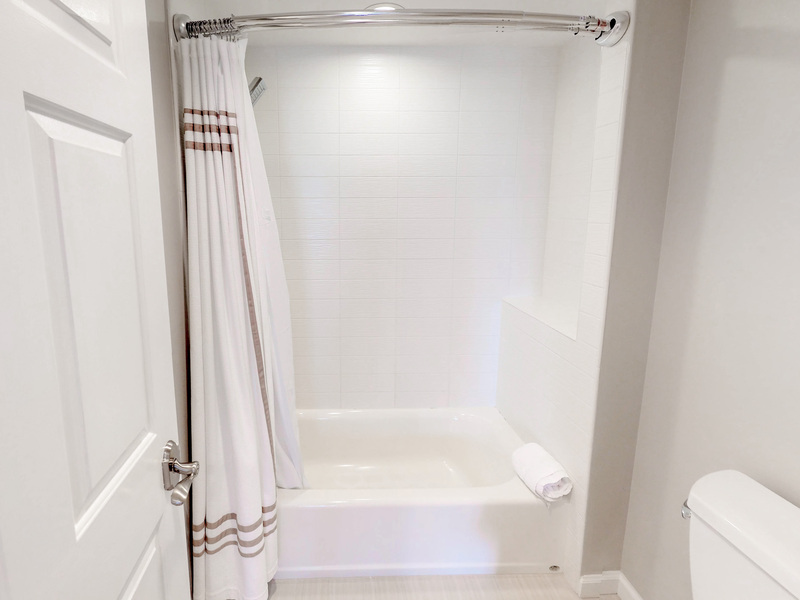 We will definitely return to this lovely condo!<br/>Water pressure in the shower was amazing, master bedroom mattress was very comfortable, and the dcor was unlike any other in Westwinds. I 2nd your compliments! Its so nice to go on vacation and truly be able to relax in beautiful surroundings. That water pressure really comes in handy after a long day at the beach in the sugar white sand. Westwinds is truly a fabulous location for families. We hope you plan to visit again soon. We do have a special discount for repeat guest. Just give Platinum Services a call and we will happy to assist with your next booking. Gorgeous condo. Beautiful decor. Excellent condition. Perfect view!!!! Short and sweet! This review describes this unit in 8 words! 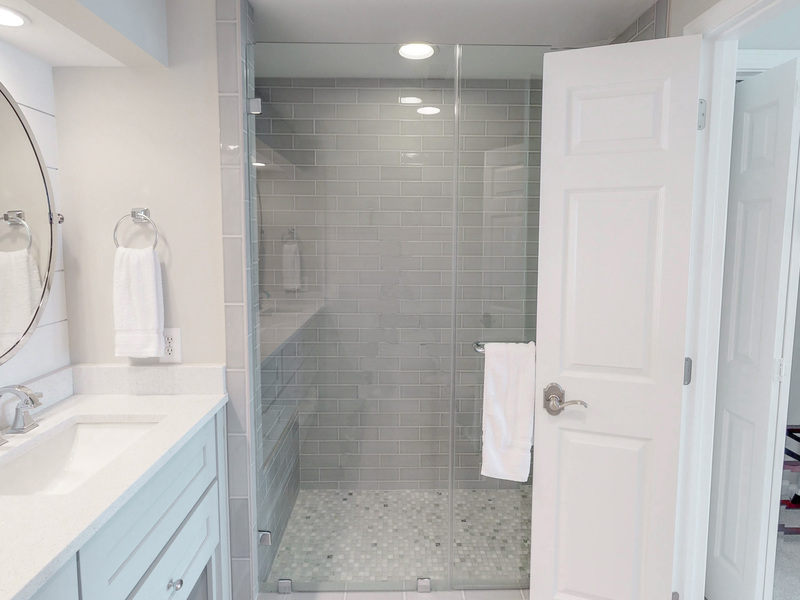 This unit was completely renovated and is absolutely gorgeous! Thank you for the great review! We would love to have you stay with us again!